I forgot that I had uploaded these photos last week! These are from the previous Sunday, not yesterday. A group of us went hiking at Bandalier National Monument. There is an ancient cliff dwelling and reconstructed kiva (an underground space for religious ceremonies) that you reach by climbing a series of ladders and steps. It was a hot day! This picture is on the way to the dwelling. This picture is looking up from one of the landings on the climb up to the dwelling. This is the cliff that overhangs where the dwelling once was. Now, these dwellings are west of the visitor center at Bandelier, and the waterfall pictured below was towards the east of the center. As far as my knitting goes, I actually finished the Bonsai Tunic from the Spring Interweave Knits issue. I promise photos next time, but right now the cafe I am at is closing and I've got to go home! One of the activities that I looked forward to in Santa Fe this summer was hiking. Just as it didn't take long to find the knitters amongst my colleagues, it took only a week to discover the hikers. Yesterday we drove up to the Ski Basin and hiked 8 miles round trip to the Puerto Nambe Meadow and back. It was a gorgeous day, not to hot or cold. For the most part there was not a cloud in the sky. The first part of the hike was the most difficult, boasting a steep ascent that made me question whether I had enough water on me. Santa Fe itself sits around 7,000 feet above sea level. 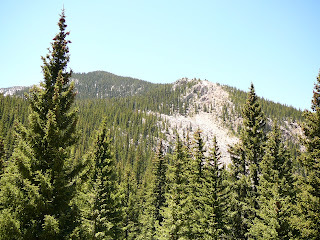 The Ski Basin sits higher, and our hike took us to somewhere just under approximately 12,ooo feet. I'm hoping to have a greater lung capacity when I return to Austin! Once we reached the meadow we rested and lunched. 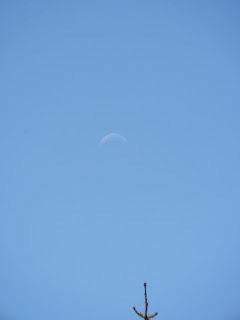 One of the other hikers noticed a slip of the moon visible in the afternoon sky. It's faint, but you should be able to spot it in this picture. I love my camera - many thanks to my mom and dad who so wisely choose it! See how nicely the macro setting works? 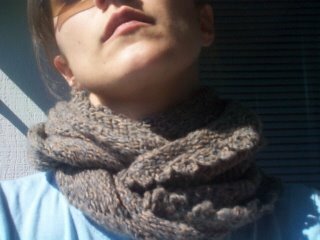 I'm thinking of playing around with some dyeing of yarnstuff at the end of the summer. Wouldn't this make up a nice colorway? 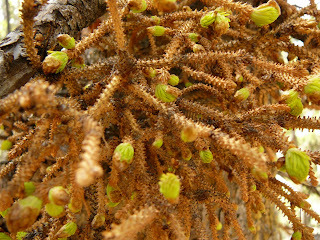 This was growing on a tree trunk and seemed to be some sort of parasite. After we hiked we stopped in at a spa on the way back to town called Ten Thousand Waves to soak in the hot baths, saunas, and reenergize in the cold dip. No pictures of that, sorry. It was absolutely delightful though, and my sore muscles thanked me, both yesterday and today. The women in our group decided against the communal bath in favor of the more private women's bath. Dress is optional, and apparently the men in the communal bath take that to heart. We stuck with swimsuits. In knitting, I have nearly finished the first of another pair of socks, knit out of Lorna's Laces in a colorway that is all purples and fuschia. And they are for me. I don't know what has gotten in to me lately, but purple has crept in to my color world. As for the pink, I don't know what to tell you. I'm going to blame it on my exposure to it through my friends Amanda and Noelle. My resistence has broken down. No bubblegum pink though. It is absolutely banned - with the exception of the Manhands band tank top, of course. It's just to much fun. So the images in this post are in reverse chronology. Here is a pair of socks, one done and the other in progress. Thanks to "Safety Day" training at the Opera, the second sock is finished! Are you excited Jamie? I'll be in touch on where to send these. That Guy and I took this picture on a roof top bar in Santa Fe, my temporary abode for the next two months. It is spectacular here! I found an excellent jogging route that has great views. My roommates are both very cool and fun, and the team I work on at the opera is great. It will be a very good summer. I can't explain to you fully, after this first year of grad school, how nice it is to be working and earning money. We had a great trip to SF, camping and seeing the Carlsbad Caverns, Taos, and SF (of course). It was good for him to see where I was going to be spending my time. The opera itself is an entire complex. There are something like 700 employees in all while they are in production during the summer. Singers, administrators, technicians, stage managers, you name it, we are all here. There is a Cantina if you don't want to bring your lunch everyday (it is several miles away from downtown SF) and a pool. You can bet I'll be swimming when the temps start to climb. The Carlsbad Caverns were the first place we visited. They are sooooooooo vast inside. This is the view from the Entrance Trail, looking back up and out to the sky. From here we spent more than two hours underground. It was a little overwhelming, kind of like the House on the Rock. If you have been there, you know what I mean! Our campground was at Brantley Lake State Park. It was on a plateau. In the middle of the Chihuahan Desert. Thunderstorms were in the forecast the second night we were going to stay, so we beat a fast trail up to Santa Fe. This worked out better because it allowed us a full day in Taos, and a full day in SF. Now that I am a little more settled in for the next two months, there is plenty to do. Work, yes of course, but other activities as well. There are several opera sponsored parties that the employees attend, and the employees like to hosts some themselves. It is tradition to frequent a particular Plaza bar on Tuesday nights ($2 beers, $2 for a dozen chicken wings, fantastic!). I'm still seeking out the hikers, but I've located several knitters. Yesterday I had the afternoon off, so I went in search of the local yarn shops. Wildly enough, they are all located around the Plaza area. However, they all carry different lines and types of yarn, so they aren't in competition with one another. I like them all! I purposefully did not take any money with me so that I wouldn't buy anything. I will allow myself a souviner skein or two, but I have plenty of yarn and I am trying to knit through some of my stash before I allow too many more purchases.